The MetroWest Chamber of Commerce serves a core area comprised of ten cities and towns: Ashland, Framingham, Holliston, Hopkinton, Natick, Sherborn, Southborough, Sudbury, Wayland and Westborough. The Chamber's membership and services also extend to the communities of Bellingham, Dover, Franklin, Hopedale, Hudson, Marlborough, Medfield, Medway, Millis, Milford, Northborough, Wellesley, Weston and beyond, serving more than 500 member organizations with business interests in the Greater MetroWest region and representing more than 35,000 employees. With populations ranging from just under 5,000 to over 68,000, the communities of MetroWest feature diverse geographies, demographics, and forms governments. Each municipality takes pride in its flourishing business community, with many cities and towns hosting some combination of local chambers of commerce and business associations, economic development corporations, redevelopment authorities, and industrial districts. These communities have colorful histories and bright futures. History comes alive in the districts of the MetroWest Chamber, as most of these towns were founded in the 17th and 18th centuries and played instrumental roles in the American and Industrial Revolutions. The Town of Ashland’s ideal location midway between Boston and Worcester provides easy access to the interstate highway system and the Massachusetts Turnpike. Ashland, was, in earlier times, a stopping point on a major Indian trail which later became known as the Bay Path, connecting Cambridge and Connecticut. It was here that a community of Natick Indians was established as the Village of Magunkaquog in about 1659. Once the original starting point of the world famous Boston Marathon which still runs through Ashland, the town is also known as the site of Henry Warren’s invention of the electric clock, later manufactured here under the Telechron name. 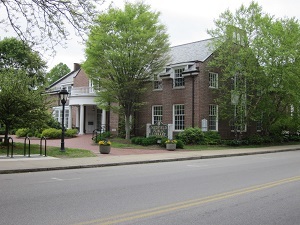 The Ashland Historical Society, located on 2 Myrtle Street, ensures the preservation Ashland’s rich historical background. Ashland, although predominantly residential, is committed to a close working relationship with its business community. Businesses, residents and visitors look forward to “Ashland Day,” a not-to-be-missed annual celebration of traditional New England Spirit. 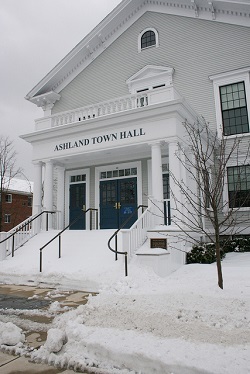 Click Here for a copy of Town Manager, Tony Schiavi's 2013-2016 Strategic Goals and Objectives for the Town of Ashland. The Town is eight miles long, two miles wide at its South end and three miles wide at the North end with an area of 18.55 square miles. It is surrounded by seven Massachusetts towns and Woonsocket, Rhode Island to its South end. The Town of Bellingham was named for the third Governor of the colony of Massachusetts Bay, a puritan lawyer, Sir Richard Bellingham. Sir Bellingham, whose name is preserved in Hawthorne’s famous "Scarlet Letter", was born in England in 1591 and educated as a lawyer there. In 1719, Bellingham was the last Town incorporated in Norfolk County. Early history and records show that the Town was once an active and flourishing manufacturing Town, producing boots, shoes and other leather goods. Today Bellingham is a vibrant community of 16,000 residents. The Town has a mix of industry, major distribution centers, as well as nearly 1,000,000 sq. ft. of retail which is located off exit 18 of Interstate 495. Thanks to the aggressive development of the 1990’s, Bellingham maintains a very modest residential tax rate and boasts some of the best services in the region. Dover’s history goes back over 350 years. It was first settled around 1635 and was originally part of the Dedham Grant. Prior to its incorporation as a Town, the area was named Springfield because it was predominantly a farming community with open fields centered around the “bubbling springs” of Trout Brook. It was incorporated as a Town in 1836. The chairman of the Springfield Parish committee chose the name “Dover” in honor of his ancestral home in England. Farming was once the principal industry of Dover. Other industries, including lumbering for the shipbuilding industry, a grist mill, a nail factory, and an iron rolling business, were also developed. Little remains of Dover’s industrial heritage. However, the remains of the Dover Union Iron Mill in Noanet Woodlands were reconstructed and serve as a monument to the ingenuity of the Town’s forebears in using water power to drive the machinery to create iron bars. While farming is largely absent today, Dover’s farming heritage is still evident in the rural quality of the Town. Scenery common to farming communities in New England (such as open pasture land; stands of white pine, birch, oak, and maple; old stone walls dividing properties; and farm houses and barns) is still very much in evidence today. This heritage and country atmosphere is highly valued by the citizens of Dover. Located in Eastern Massachusetts, Framingham was the largest town in the Commonwealth of Massachusetts and the hub of the Metro-West region. As of January 1, 2018, Framingham is now "The City of Framingham", voted in 2017. Framingham offers a unique blend of urban and rural qualities. The vibrant retail area along Route 9 lies close by quiet residential areas and the town common. 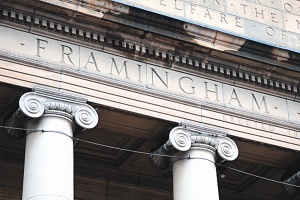 From its founding in 1700, Framingham has supported a variety of industries. The mills and factories that flourished in Framingham encouraged the growth of the Saxonville area of the town and the downtown. Currently, the major town employers are primarily non-manufacturing, including medical, retail, educational, office and biotechnical activities. Many large corporations are headquartered here, including, Bose, Staples and TJX. The residents of Framingham value public participation and the town is the largest municipality with a town meeting form of government. Framingham offers recreational activities of all sorts for its residents, from the many organized team sports leagues to the nationally renowned Garden in the Woods. Framingham unites for numerous municipal celebrations throughout the year, with a major focus on Flag Day activities in June. Framingham is the home of the world renowned Framingham Heart Study. The Town of Franklin is a suburban industrial community on the watershed between the Charles and the Blackstone Rivers, 22 miles southwest of Boston.. Settled in 1676, Franklin spent its first hundred years as the western part of the Town of Wrentham. Incorporated on February 16, 1778, Franklin became the first town in the United States to name itself in honor of the great statesman, Benjamin Franklin. Dr. Franklin responded with a gift of 116 books for use by the Town's residents. On November 20th, 1790, those attending Franklin's town meeting voted to lend the books to all Franklin inhabitants free of charge. This vote established the Franklin collection as the first public library in the United States. 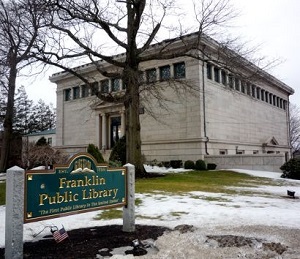 The original Franklin collection is still housed in a book case in Franklin Public Library's Reading Gallery. Since it was first settled in 1659 and incorporated in 1724, Holliston has grown from a community of a few hundred residents to a community of nearly 15,000. 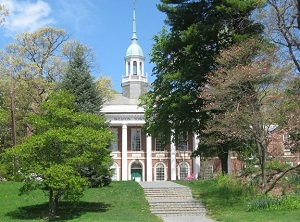 The town is named after Thomas Hollis, Esq., a benefactor of Harvard College. 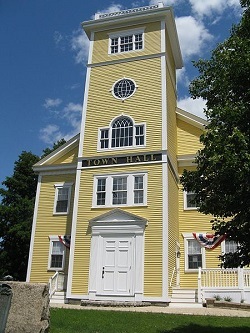 Holliston is known for its quaint Town Center, which holds antique shops and boutiques, the town hall, public library, and beautiful churches. Holliston is home to many attractions such as Fiske’s General Store, founded in 1853, and Fatima Shrine. 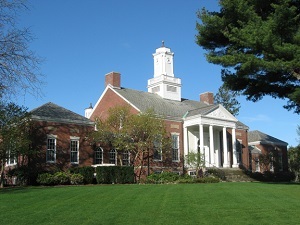 Holliston takes great pride in its nationally recognized school system, dedicating over $23 million to education in its annual budget. There are many events for children through the school system as well as through town sports departments and the town parks department. Every year, Holliston holds the event “Celebrate Holliston” with a parade and field day, growing in numbers each year. Hopedale is on the southeastern edge of Worcester County and occupies the valley of the upper Mill River. Benjamin Albee set up a grist mill on the Mill River to grind settlers' corn in 1669 in the first recorded settlement. Until the mid-19th century, the town followed the pattern of many communities with a combination of agriculture and small industry. A 64-square-mile area of the Blackstone Valley was incorporated as the town of Mendon. In 1780, Milford separated from Mendon. On August 26, 1841, Adin Ballou, along with the Practical Christians, gave Hopedale its name, within the town of Milford. Ballou and the Practical Christians established the Hopedale Community based on Christian and socialist ideologies in 1842. The town was officially incorporated in 1886 when it separated from Milford. Hopedale was once home to the Draper Corporation, once the largest maker of textile looms in the United States. The company was acquired by Rockwell International in 1967. Hopedale is included in the Blackstone River Valley National Heritage Corridor and is an historic mill village of national significance. Hopkinton is mainly a residential community, located within commuting distance to many major destinations, including Boston. The source of the Charles River is found in Hopkinton. There are several recreational features including hiking trails, a town forest, and a town beach, along with many ball fields for various sports. The Massachusetts Audubon Society has land in Hopkinton. The area is open to the public with walking trails available. The Hopkinton State Park offers facilities for swimming, boating, hiking, fishing and picnicking. The Whitehall State Park has a boat ramp, as well as a series of trails surrounding the lake. 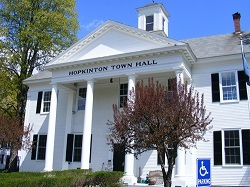 Hopkinton gains national attention once a year in April. The B.A.A. Marathon has started in Hopkinton since 1924. Runners from all over the world gather on Main Street to begin their 26-mile run to Boston. On July 4th each year, Hopkinton has a local parade. The Polyarts Festival is held in the fall and includes performing arts, exhibiting artists and craftspeople. During the summer, a series of concerts is held on the Town Common. 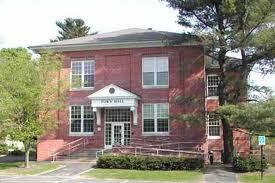 In 2011, Hopkinton High School was ranked the 95th best high school in the nation by Newsweek. It was also ranked the second best school in the state by Newsweek. Rankings were based on a schools’ four-year graduation rate, the proportion of graduates immediately entering college, and the number of Advanced Placement tests taken per graduate. Before its incorporation as a town in 1866, Hudson was a suburb of the neighboring Marlborough, Massachusetts, and was known as Feltonville. And before that Eastborough. From around 1850 until the last shoe factory burned down in 1968, Hudson was known as a "shoe town." At one point, the town had 17 shoe factories, many of them powered by the Assabet River, which runs through town. Because of the many factories in Hudson, immigrants were attracted to the town. Today, most people are of either Portuguese or Irish descent, with a smaller percentage of people being of French, Italian, English, or Scots-Irish descent. Magunkaquog in about 1659. Once the original starting point of the world famous Boston Marathon which still run. 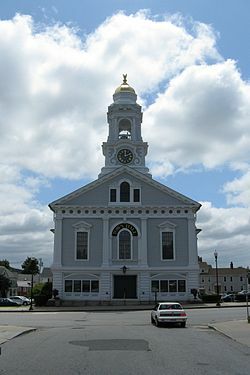 Marlborough was declared a town in 1660. It later became a city because of the population size. In 1711 Marlborough's territory included Northborough, Southborough, Westborough and Hudson. As population, business, and travel grew in the colonies, Marlborough became a favored rest stop on the Boston Post Road. Many travelers stopped at its inns and taverns, including George Washington, who visited the Williams Tavern soon after his inauguration in 1789. The construction of Interstates 495 and 290 and the Massachusetts Turnpike has enabled Marlborough to begin its fifth century on the cutting edge of a new industry: high technology and specialized electronics. Today, thousands flock here to work at TJX, Raytheon, Hewlett-Packard, AMD, Sun Microsystems, Navilyst Medical, Netezza, Boston Scientific, Sunovion (formerly Sepracor), 3Com, Egenera, Evergreen Solar and the many other electronics and computer firms that provide the strong business community in the city. Because of the city's central location with easy access to major highways and the pro-business, pro-development policies of the city government, the population of Marlborough has more than doubled in the last 25 years to over 38,000 at the time of the last census. In November of 1649, Dedham held a town meeting which approved the laying out of an area for a new town. This was accomplished in the early spring of 1650 and corresponds very nearly with the boundaries of the present town. The thirteen original settlers paid fifty pounds to the inhabitants of Dedham in compensation for the land. Medfield was finally incorporated as the 43rd town in Massachusetts on June 2, 1651. By 1660 the town was laid out and new families admitted, thus increasing the population to 234. 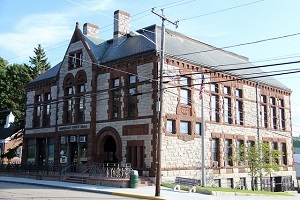 Medfield remained a rural village for all of the nineteenth century. 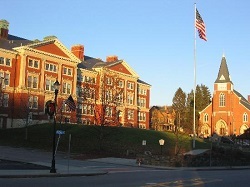 However, with the 1896 establishment of the "asylum," (now Medfield State Hospital), the population of the town grew to over 3,000 by the end of the century. Half of the town's population were patients at the hospital, which provided employment for over 600 residents of Medfield and surrounding towns. The Town of Medway is located in Norfolk County, Medway originally was part of the town of Medfield. 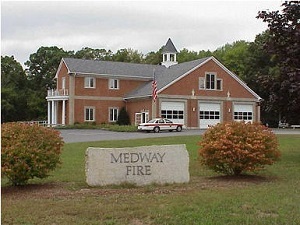 Medway is bordered on the south by the Charles River and the town of Franklin, on the east by the town of Millis, the town of Holliston to the North and Milford and Bellingham to the West. Medway was first settled in 1657 and was officially incorporated in 1713. At that time, Medway began as a farming community of two hundred thirty-three. It was not long before the water power of the Charles River and Chicken Brook stimulated the formation of cotton and paper mills, straw and boot factories, and a variety of cottage industries. Medway demonstrates the central importance of the Charles River and the thriving town that grew alongside it. Today, the one-room schoolhouses are gone and the country stores have moved to the mall, but the open town meetings continue. At its founding, and for 170 years afterward, the town of Medway included the land that is now Millis. Eventually, the eastern section of the town, known as East Medway, separated in 1885 to form the town of Millis, and Medway assumed the shape it has today. The Town of Milford is a thriving Massachusetts community of over 27,000 residents, conveniently located along I-495, with easy access to Boston, Worcester, and Providence. Milford was first settled in 1662 and was officially incorporated in 1780. It was originally the eastern part of Mendon, called "Mill River". Milford is renowned for its pink Milford granite, discovered in 1870. Some of this granite has been used for buildings in New York City, Washington, D.C., and Paris, along with a number of war memorials and other monuments, including the Battle Monument at West Point. Milford offers many advantages to residents and visitors alike - an education system with modern facilities and excellent curriculum offerings; newly constructed and upgraded municipal buildings; playing fields and parks for active and passive recreation; a multi-use trail (Milford Upper Charles Trail); major shopping plazas; a revitalized downtown; an active Cultural Center; a first class regional hospital; and a wide variety of restaurants and hotels. The Town of Millis is located in western Norfolk County, Massachusetts, along the Charles River. Formerly an industrial town, today we are primarily a suburban community with rural areas remaining on our outskirts. Millis is bordered by Medway on the west, Holliston and Sherborn on the north, Medfield on the east, and Norfolk on the south. Millis is 26 miles southwest of Boston, 32 miles east of Worcester, and 32 miles north of Providence RI. Major roadways include Rt. 109 which connects east and west to state Rt. 128 (I-95) and I-495. Route 115 is the major north-south route through town. The center of town is located near the intersection of Rt. 109 (Main St.) and Rt. 115 (Plain St.). The total land area of the town is 12.16 square miles. Rail transit to Boston is available in the neighboring town of Norfolk and the nearby towns of Needham, Walpole and Franklin. 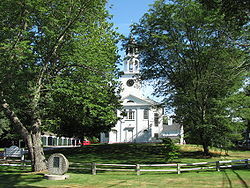 Millis was first settled in 1657 and was originally part of Dedham, Massachusetts until that town granted the lands of Millis, and other present day surrounding towns, to Medfield in 1651. In 1713, pioneers of Medfield applied for a grant to create a new town and, when approved, named this new land Medway. This new town consisted of West Medway (present day Medway) and East Medway (present day Millis). Millis incorporated as a separate town on February 24, 1885. 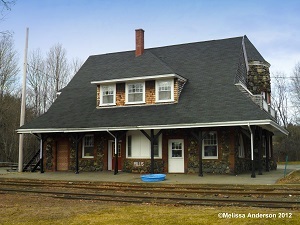 Millis is named after Lansing Millis, one of the founders of the town. 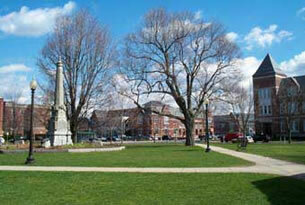 Natick was first settled in 1651 and was officially incorporated in 1781. Once a predominantly farming town, Natick is now home to many large companies, including Boston Scientific, Math Works and Cognex, in addition to many smaller companies. It is located 16 miles west of Boston, with direct access to major routes (Route 9, Route 128, Mass Turnpike, etc). In the downtown area, there are numerous fine restaurants, as well as The Center for the Arts (TCAN), providing a wide variety of shows and music to satisfy residents and non-residents alike. Natick has attracted a wide variety of retail stores within the Natick Mall. Natick has a nine-hole executive golf course at the former landfill, numerous playing fields for baseball, football, soccer, and a skating rink all within walking distance of the high school. The town has many walking and bicycling paths and the Broadmoor Wildlife Sanctuary. One elementary school has received The National Blue Ribbon Award given by the US Department of Education. 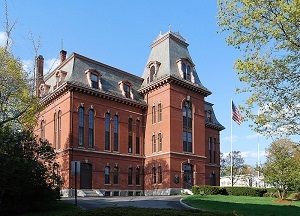 By an Act of the Legislature, Natick is the “HOME OF CHAMPIONS”, inspired by The Union Ladder Company win in the Worlds Hook and Ladder Championship in competition in 1891. Sherborn is a small semi-rural community located about 18 miles southwest of Boston. Settled in 1652 and incorporated in 1674, the town is proud of its rural heritage, which is still evident in many active farms and orchards, preserved in Town Forest and other extensive public lands. Open space comprises more than 50% of the town’s area. Because all properties have individual wells and septic systems, minimum house lot sizes are one, two or three acres, depending upon location. Sherborn is an active, outdoors-oriented town where residents enjoy miles of trails through woods and meadows for walking and horseback riding, swimming and boating in Farm Pond, and participating in any number of team sports. A high degree of volunteerism due to strong citizen support for town projects, and commitment to excellence in public education, characterize the community’s values today, as they have for more than 300 years. 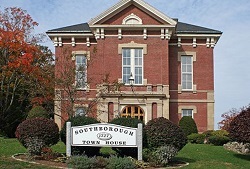 The Town of Southborough was officially established in 1727 and was once primarily a farming community. With nearly 25% of the town covered by the Sudbury Reservoir, Southborough has retained a low density rural/suburban character. Industries in Southborough grew substantially after World War II with the “high tech” industry and the construction of Interstate 495. 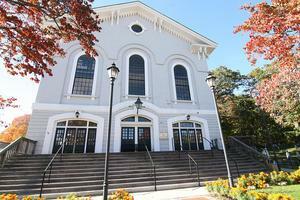 Each year, Southborough celebrates Heritage Day on Columbus Day. The day involves a parade including youth organizations, the Algonquin High School Marching Band, as well as police and fire vehicles. The parade ends near St. Mark’s green with a plethora of local vendors and organizations offering activities, food and information. Southborough is known for its scenic trails available for hiking or walking, particularly through Chestnut Hill Farm. With two miles of trails at Chestnut Hill Farm alone, there are various opportunities to enjoy the scenic joys of Southborough. Sudbury has deep roots in American history. In 1638, the first white settlers came to Sudbury, some directly from England. This was the second settlement above the tidal streams, and it was incorporated in 1639. The original Sudbury Plantation straddled the river; land grants were from the colonial legislature and payment was made to Indian owners such as Karte (Goodman). As the settlement grew, Sudbury townsmen developed not merely a new community, but a new concept; government with the consent of the governed. Sudbury’s role in the development of the town meeting form of government, and its insistence upon the direct right of a citizen to choose his governors and make himself heard upon any issue in open forum, did much to lay the foundation of American democracy. The town still maintains a rural character and is proud of its history. The Sudbury Historical Society offers both an online historical tour and a walking historical walking tour, which capture the historical essence of the town. Incorporated in 1780, the town of Wayland is a peaceful community located in MetroWest situated at the halfway point between Boston and Worcester. While Wayland is located in an area that provides easily accessible shopping, sightseeing, dining and entertainment, Wayland itself remains a quiet bedroom community in a semi-rural setting with little industrial or commercial base. Wayland is the home to many urban professionals due in part to its peaceful setting and its close proximity to the City of Boston. In addition to that, Wayland is an ideal community to raise a family as Wayland’s School System is known as one of the finest school systems in the state. The town has taken many steps to preserve forests, marshes and fields that surround the Sudbury River and provides its residents an opportunity to enjoy these areas for passive recreation. Wellesley was settled in the 1630s as part of Dedham, Massachusetts. It was subsequently a part of Needham, Massachusetts called West Needham, Massachusetts. On Oct 23, 1880, West Needham residents voted to secede from Needham and the town of Wellesley was later christened by the Massachusetts legislature on April 6, 1881. The town was named after the estate of local benefactor Horatio Hollis Hunnewell. 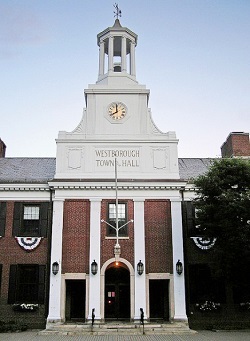 Since its incorporation in 1717 as the 100th town in Massachusetts, Westborough has grown from a settlement of orchards and dairies into a dynamic community with a healthy mix of residences, wooded trails and industry. At the intersection of the Mass Pike, Route 495 and Route 9, Westborough is an ideal location for business headquarters. 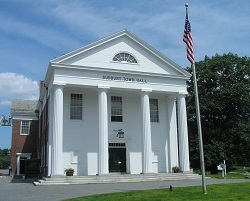 Spurred by the advent of the train in 1834, Westborough has been home to diversified manufacturing, ranging from sleighs, straw hats and boots in the past to computer and telecommunications equipment today. Westborough has also emerged as an important regional center for office development, with 35 percent of its employment devoted to the service sector. Westborough’s population of a little more than 18,000 residents enjoys fine schools, extensive public services for all ages, and active recreation programs on its lakes, woodlands and playing fields. The Town of Weston is an attractive suburban town on the perimeter of metropolitan Boston. Incorporated in 1713, the town is located on a rugged upland plateau. Early settlers discovered that the amount of useful agricultural land was limited as was the waterpower potential in the town. But colonists moving in from Watertown in the mid-17th century established scattered farms in Weston, and by 1679, a sawmill, several taverns, some doctors, and according to the historians, "probably some lawyers," had settled in Weston. By the 18th century, residents were profiting by the traffic on the Boston Post Road. The Weston Aqueduct and Reservoir were built in 1903 and the Hultman Aqueduct followed in 1938 to bring Quabbin Reservoir water into Boston. In exchange, Boston residents continued to build homes in Weston, many of them architect designed. 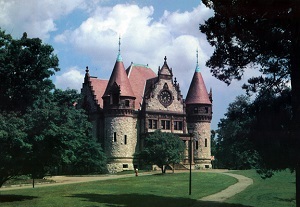 Some famous architects such as McKim and Richardson designed luxurious houses in the town, which witnessed a rapid increase in population from 1920 to 1935, and then again after World War II. The Boston oriented suburbanization has continued as a major factor in the town's development. Residents are very proud of the town's school system and the handsome homes in quiet, well-kept neighborhoods, but tend to brush off the town's reputation as one of the most affluent communities in the state. Weston has carefully retained significant amounts of open space and maintains over 60 miles of hiking and horseback riding trails, playgrounds, ball fields, golf courses and cross-country skiing areas.